A cauliflower hat, a fish bonnet, a few large animals, a flying boar called Melvin, and a whole lot of watermelons come together in this wacky tale told in rhyme To the villagers who watch her going about her day, it is clear that Miss Jolly is irritatingly happy. Her never-ending cheerfulness leaves three of her neighbors highly confused and jealous, driving them to ridiculous and hilarious measures in an attempt to compete with Miss Jolly in the happiness—and headgear—stakes. Beautiful and insane in equal measure, this wacky book follows three local busybodies on their journey to discover the secret of true happiness. Daniel Hahn is a writer, editor, and translator. He has translated fiction by novelists including José Eduardo Agualusa, José Luís Peixoto and María Dueñas; and non-fiction by writers ranging from Portuguese Nobel laureate José Saramago to Brazilian soccer player Pelé. He is also one of the editors of the Ultimate Book Guides, an award-winning series of reading guides for children and teenagers, and is currently assembling a new Oxford Companion to Children's Literature. 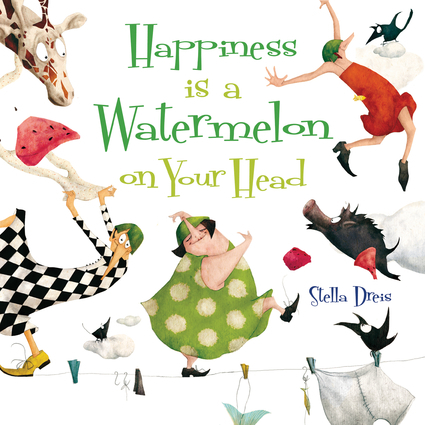 Stella Dreis is a children's book illustrator. Her previous titles include The City that Went Off and The Princess and the Pea.